HP's ProBook 6540b is a well-priced business notebook with plenty of features. Its performance and battery life are more than adequate and the management software that comes with it is very easy to set up and use. The only problem with our review unit was its touchpad buttons, which stuck when we pressed them. HP's ProBook 6540b (WH431PA) is a business notebook through and through. It provides an adequate amount of speed, it's comfortable to work on, and it even ships with easy-to-use management features so that data can be encrypted and certain features can be locked down depending on who uses it. The best part is, it's not expensive. The HP ProBook 6540b (WH431PA) looks like a hulking beast with its large, 15.6in LCD screen and thick base. However, it's reasonably easy to handle because it's not overly heavy; it weighs in at around 2.6kg, which is definitely a manageable weight for a 15.6in unit. It feels sturdily built and it even has metal hinges that hold the screen perfectly in place. The keyboard is full sized and comfortable to type on. The keys feel crisp when they're pressed, but the chassis emits an almost hollow sound when they are hit, which can get annoying. There aren't any keys in awkward positions, only the arrow keys are undersized, and the number pad is very useful. There are touch buttons above the keyboard that can be used to manipulate the volume, launch the calculator, disable the wireless radio, and launch HP's software setup utility as well as the default e-mail program. The touchpad resides on a deep palm rest and it's a little 'sticky' — sometimes the pointer doesn't end up where you want it. It doesn't support gestures, but you can slide your finger along the right edge to scroll. The touchpad's left- and right-click buttons were awful during our tests; the right button in particular would stick when it was pressed, almost as it if it was broken. This may just be because our review unit had done the rounds, but it's worth noting as it's a problem that might occur down the line after a lot of use. An Intel Core i5-520M CPU gives the ProBook 6540b two physical cores and Hyper-Threading, which means it will be great for multitasking. However, the notebook's overall performance in our tests was slightly slower than we expected. It recorded times of 57sec and 1min 13sec in the Blender 3D rendering and iTunes MP3 encoding tests respectively. Consumer notebooks such as Samsung's R580, which runs the same CPU, are a little faster in these tests. The ProBook 6540b runs Windows 7 32-bit, so it can only utilise a maximum of 4GB of DDR3 SDRAM, and this is how much HP has installed in this model. It also runs an integrated Intel HD graphics chip, which takes up about 1GB of that RAM. The upside is that it gives the 6540b more graphics grunt than usual for a business notebook (it recorded 2091 in 3DMark06) so high-resolution photos and graphics-heavy presentations can be viewed with ease. The screen has a native resolution of 1366x768 though, which is low for a 15.6in screen but typical for the price point of this system ($1499). There's a big focus on security with the Probook 6540b. 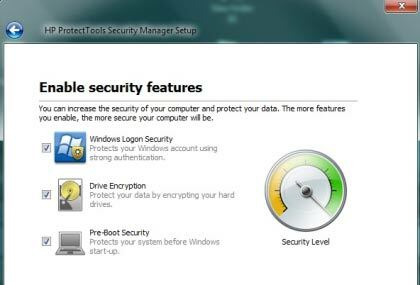 It comes with a TPM 1.2 chip to store credentials and HP's ProtectTools utility allows you to easily set up a Windows password, hard drive encryption and pre-boot security, which prompts you for your password or a finger swipe before you even get to Windows. It's easy to enable the supplied security features. Hardware encryption is based on McAfee Endpoint and requires a USB drive on which to store the encryption key. The hard drive encryption process took just over four hours during our evaluation. You can still use the laptop while the drive is being encrypted, but its reaction time when loading applications and moving windows around will be a lot slower than usual. An encrypted drive will make disk-intensive tasks slower, but HP has installed a 7200rpm, 250GB drive to minimise the hit. In our transfer tests, we recorded an average rate of 25.23 megabytes per second with encryption and 31.7MBps without encryption. The fingerprint reader resides on the right side of the palm rest and it was reliable during our tests. However, if you use the number pad regularly your palm will brush it and the system will emit the equivalent of the Family Feud 'wrong answer' sound because it can't recognise what has just passed over it. Luckily, you can disable the sound. Nevertheless, we'd prefer it if the fingerprint reader was placed either above or below the touchpad. In addition to logging on to the system, you can use the fingerprint reader in conjunction with the password manager. If you register the login details of your favourite Web sites, you can log in to them just by swiping your finger. 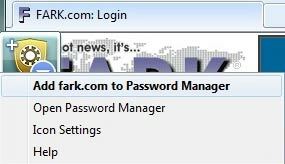 The password manger will show up in the top-left corner of the browser window when you get to a site with a login field. If it's a site you're a member of, simply place the cursor in the login box and click the plus sign on the password manager icon to enter your details so that you can just swipe your finger every time you want to log in. If you come across a site that you don't have login details for, the password manager icon will be annoying unless you move it up out of the way. Store passwords for your favourite sites and log on using the fingerprint reader. With a 55 Watt-hour, 6-cell battery installed in its spine, the ProBook 6540b has an adequate amount of life away from an outlet. In our test, in which switch off power management, enable Wi-Fi, maximise screen brightness and loop an Xvid-encoded video, the ProBook lasted 2hr 13min. It's a pretty good result for a 15.6in notebook with a Core i5 CPU and you can get more life out of it if you dim the screen and enable a power management plan. Along the sides of the ProBook 6540b you'll find four USB 2.0 ports (which is plenty), a mini-FireWire port, a full-size ExpressCard/54 slot, an SD card slot, a DVD burner, microphone and headphone ports, DisplayPort and a serial port. The power, VGA, Ethernet and modem ports are located on the back of the unit, which means those cables will be out of the way when you're working at your desk. You also get a webcam, Bluetooth and 802.11n (dual-band) Wi-Fi. The HP ProBook 6540b is a fully stocked notebook for corporate users that's very enticing at $1499. It was a little slow in our tests, but since most business users won't use the notebook for encoding media and rendering graphics that won't be an issue. It's a fine machine for running office software and, most importantly, multitasking. We had some issues with its touchpad buttons not working properly, but we chalk that down to our review unit running up plenty of kilometres; overall the unit is very well built and has lots of useful connectivity.